Then yesterday morning I received an invitation to a media event that is happening on Tuesday, by which time my new cards will, sadly, not be ready. I briefly considered printing the QR code on Avery labels and affixing them to my current cards, but obviously that would look pretty cheesy. What I needed was some kind of rudimentary printing process – like a rubber stamp. As it turns out, there are a number of online rubber stamp services to choose from. This is where the story gets a bit like the Bugs Bunny cartoon in which Bugs sends off a mail order and then stands beside the mailbox until the package arrives. Simon’s Stamps accepts bitmap graphic submissions and guarantees same-day delivery on items received before noon. 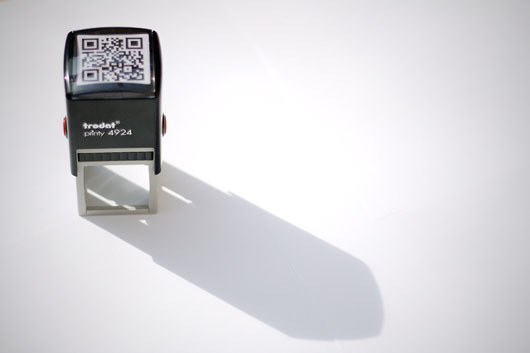 I uploaded my QR code at about 11:30 yesterday morning, and my self-inking stamp arrived at my door about an hour ago. It works so well that I’m kind of sorry I ordered business cards at all; I’d rather just run around stamping things now, because as they say out west, it’s hella fun. This, I have been telling my friends, is what it’s like living in the future.